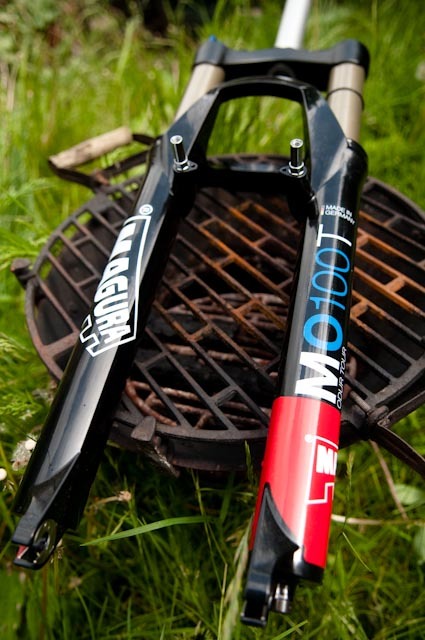 These are 100mm Magura Odurs. I've fitted the 85s. 2am, and the bike is packed. Phew. London tomorrow, Alaska on Saturday. Just in the nick of time (thanks Michael and Robbert), the Magura Odur fork (nice name) arrived this afternoon, with extra-extra long steerer (for the extra-extra long headtube). After the usual fettling, it was sliced down to size and fitted with a Tubus Swing front rack. Popped out into the sunshine for a quick spin. What with some water and food, payload was probably close to 30kg, so I was fearing some squirelly handling and, hurtling down the local hill, perhaps a death wobble. 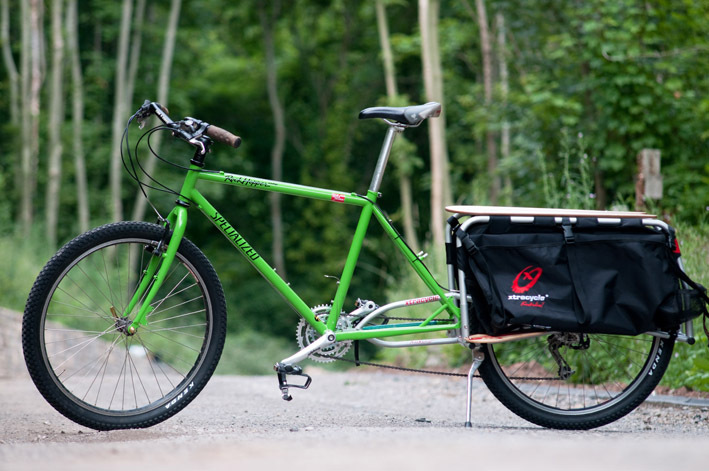 But considering the front panniers now sit so high, and there’s suspension (which was never designed to bear weight along the stanchions), the Travel Master handles surprisingly well – probably down to the stiff, oversized tubing in the frame. Anyway, it’s a good as I could have hoped for, so in a last minute change of heart, I’ve decided to run suspension forks for Alaska and North America (so I can do some mtb’ing, and for comfort on the corrugation), and then perhaps switch to rigid ones sent for Central America. The downside is more tech to go wrong – though Maguras are coil sprung and tend to be ultra reliable and well built – an extra 700g or so in weight, and the fact that the longer axle to crown length jacks up the bike a bit, so top tube clearance is on the tight side. 26in, 29er, trailers, racks and panniers, rigid fork, suspension… Sometimes I yearn for the days when I knew no better than to load up my Spesh Rockhopper (back when I owned just one bike, and thought that was quite enough, thanks) and set off in the big wide world, none the wiser. At the end of the day, it’s just different ways of cracking the same nut. To paraphrase a Texan, whatever the bike, it’s all about the ride. My old Rockhopper (my steed when riding home from Australia) has now be reborn as The Green Machine. This entry was posted in Bike Talk on July 2, 2009 by Cass Gilbert. not sure yet, depends on logistics. it might easier to ride north, and hitch a lift back south. all will be revealed after saturday evening, when I land in Anchorage!